It must have been in culinary school that I first tasted this unique leafy green. It’s generous leaves, budding broccoli-like florets and striking yellow flowers were captivating; and still are. 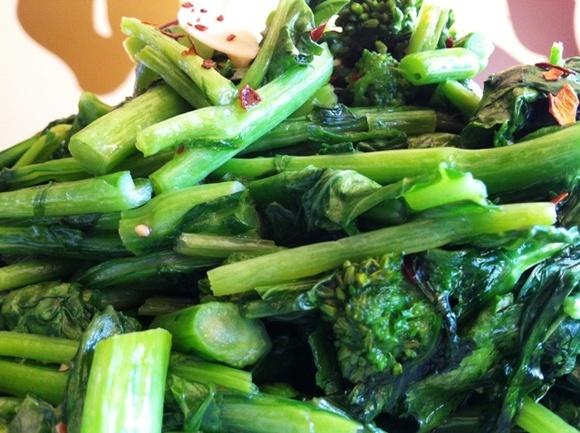 It has a few names that are familiar to us: Broccoli Rabe (or Raab) and Rapini. It is essentially a turnip but is grown for it’s shoot rather than it’s root (turnip). When cooked it has a flavor that is both sweet and bitter at the same time. This recipe is super simple. And once finished it can be used as a side dish, tossed with pasta or grains and added to soup. How versatile is that? 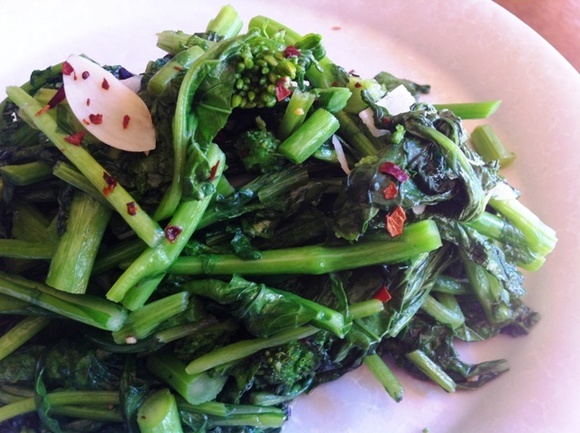 Take the bunch of Rapini and cut the stems from the leaves. Slice the stems into 1/2” pieces. Slice the leaves (and there will be a little stem along with florets) into 3rds. Set aside. Place olive oil into a large sauté pan and begin warming it over medium heat. Add garlic, red chili flakes, salt and pepper. Cook until garlic is soft. Add the chopped Rapini stems and water. Turn heat up to medium high. Stir all ingredients until the stems soften but still have a good crunch. Add the remaining leaves of the Rapini piling high into the sauté pan. With a tong begin to gently moving the bottom leaves to the top turning them repeatedly until they begin to wilt. Continue this process until soft. It should take no longer than 5 minutes. Remove from heat and serve.